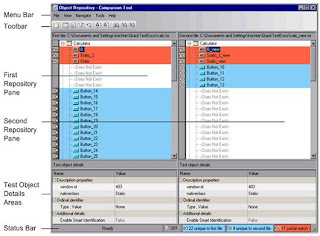 To open Object Repository Comparison Tool go to ‘Resources’ -> ‘Object Repository Manager’ -> ‘Tools’ -> ‘Object Repository Comparison Tool’. It is used to compare different objects repositories or different versions of the same object repository resource, and identify similarities, variations, or changes. Original Object Repositories remains unchanged during comparison process. You can change the color settings of Object Repository comparison tool. To change the color settings go to Object Repository Comparison Tool -> Tools -> Color settings. 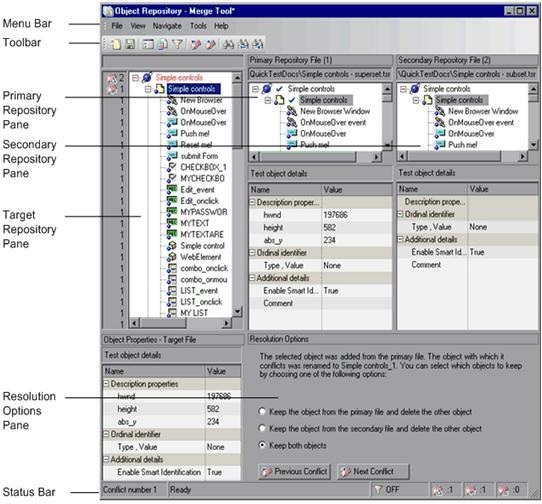 Matching description, different name – Objects that appear in both object repository files that have different names, but the same description properties and values. 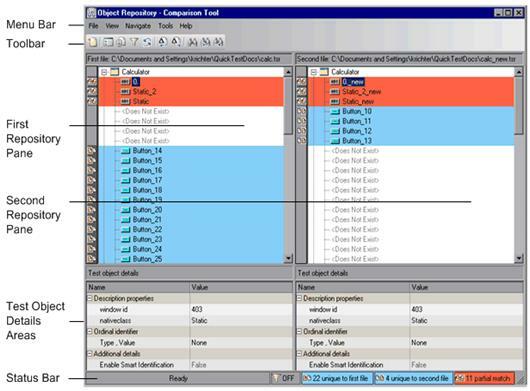 Similar description – Objects that appear in both object repository files that have similar, but not identical, description properties and values. One of the objects always has a subset of the properties set of the other object. Unique to first file, or Unique to second file – Objects that appear in only one of the object repository files. It provides the ability to merge the existing assets from 2 object repositories i.e. Primary and Secondary is merged to create third (target) object repositories. After merging it provides a graphic presentation of the original objects in the primary and secondary object repositories, which remain unchanged, as well as the objects in the merged target object repository. Objects that had conflicts are highlighted. Also see: How to deal with dynamic objects in QTP, Basics of Object Repository (OR) in QTP, QTP beginner's online training.